I usually just look at the EM forums, so I select just those to view. 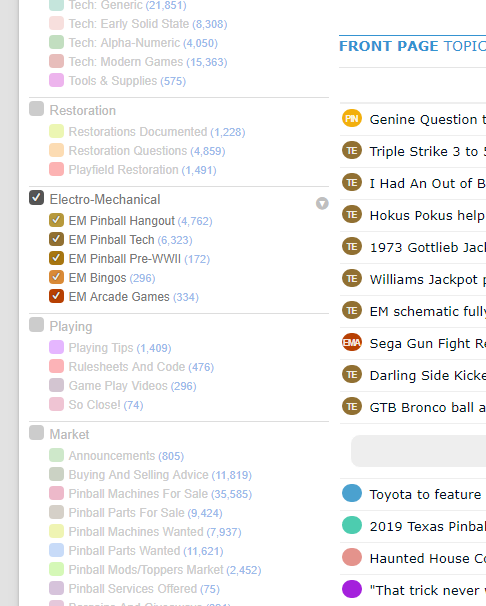 If I'm not on Pinside for a few days, when I enter pinside forums, the first "page" will show only posts from the desired EM forums, but the 2nd "page" will show posts from all the forums. Page 3, 4, etc, will continue to show posts from all the forums. The only way I've found to reset the sub-forum filtering is to logout, exit Chrome and then re-login. The forum viewer will work ok and then a few days later the problem will re-occur. This started about 6+ months ago. I tried my best to replicate this issue, but was unable to. On my end it seems to be working fine. I unchecked all sub-forums except the EM forum, then refreshed the page and started scrolling. Everything was working fine. Is there any way you could find out more, how to get this problem to occur? Also, when this happens, are you still signed in? I can imagine if your session cookie somehow gets removed that it might happen but thats just a wild guess. No. It's ok now. I'll re-post when it occurs again... probably within a few days.